"It came with no warning pop. Compressed into a fraction of a second was the shrill, expanding screech of the approaching round and the explosion that rocked the hilltop. The players, sitting Indian-style at a game of back-alley bridge, were torn to pieces. It happened in the blink of an eye. August 27, 1968." The Vietnam War's hottest year was 1968, and the demilitarized zone (DMZ) was its hottest spot. Battalions on each side stalked the DMZ's mean hills seeking contact. In this memoir the author tells of the war "up north" on the border between North and South Vietnam. There the combat was large-scale and marked by conventional battles fought by disciplined troops on both sides, each supported by heavy artillery and tanks. For each side there was a trump card: the North Vietnamese could withdraw to sanctuary across the DMZ; the Marines possessed air power. The author, a forward air controller with a Marine grunt company, fought alongside the infantrymen, directing close air support, talking helicopters into "hot" landings to evacuate wounded and communicating with aerial observers circling in slow spotter planes for a birds-eye view of the enemy. This volume provides a riveting firsthand account of the most intense fighting of the Vietnam War - DMZ, 1968, where "death was sudden, life stripped of the superfluous." 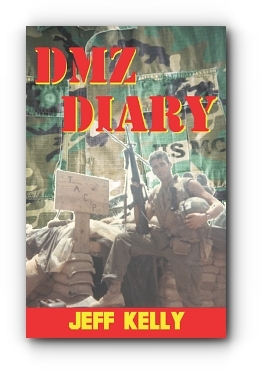 The author of this fast-paced memoir, Jeff "TJ" Kelly, recounts harrowing experiences as a radioman in a Marine company near the North Vietnamese border. His gritty diary of duty in the infamously misnamed demilitarized zone between North and South Vietnam gives in intimate view of the war. A well researched and tightly written chronological narrative. A combat Marine's riveting first-hand story of the most intense fighting of the Vietnam War - DMZ, 1968. DMZ Diary presents a "you are there" experience that is so horrifying you'll be glad you weren't. Jeff Kelly took early retirement from corporate life and worked for the United Nations in Africa and Afghanistan. Today he lives in the Florida Keys and divides his time between freelance writing and working as a boat captain.